For many startup founders, getting day-to-day operations going—product development, marketing, fundraising, and hiring—consumes most of their time. The last thing they need is another issue to think about. But when team members leave your startup and take valuable IP (intellectual property) along with them, it might be prudent to pause and consider the issues of IP. In this article, I collated a list of questions from the Tech in Asia Community about IP and asked Trina Ha, director of the legal department of the Intellectual Property Office of Singapore (IPOS), for her insights. What is IP? What falls under this, especially for a young tech startup? “IPs are creations that are recognized and protected by law and include registrable rights such as trademarks, patents, and industrial designs, and non-registrable rights such as confidential information, trade secrets, and copyright. “Generally, the law grants the creator exclusive rights for a specific duration. This means that during the period of protection, you can exploit your IP for commercial gain while preventing others from using it without your permission. Why create an IP? Wouldn’t you be showing everyone your secret? “All companies, whether a startup or a matured business, already have created some form of IP in their inventions, products, or services. IP is increasingly recognized as an invaluable business asset. It is essential for all businesses to understand how to protect and manage its IP to get the best possible commercial results. “Startups that know how to utilize their IP and put in place an IP strategy that is aligned with their company’s business strategies and goals have a strong competitive advantage in the market. “Applying for a patent does require you to make details of your invention known. However, think of a patent as a trade-off. In exchange for disclosing your invention to the government and the public, you have a monopoly over the invention and the right to prevent others from using or copying it for a substantial amount of time (20 years). “A startup may choose to protect their IP as a trade secret rather than a patent to save costs and avoid disclosure. This is a possible route if the business is of the view that competitors will not be able to copy or reverse engineer the technology. Do bear in mind that trade secrets have weaker protections than patents. At what stage does a startup pay attention to the IP they potentially have? “Generally speaking, most startups only pay attention to IP after they have attained some market traction or business stability. However, they actually should be looking into IP protection and creating an IP strategy much earlier. Incorporating IP into your business strategies early will prevent future problems and also help ensure sustainable business growth. “It does not mean that startups should secure all forms of IP protection from the get-go. Understandably, cost is an important consideration for startups. Accordingly, they should first have a good understanding of their industry and competitive landscape, the nature of their business, their short-term and long-term business goals, and identify which are their strategic business and IP assets. This will provide clarity on the types of IP protection they need and when they need it. “For instance, a brand is a form of IP as it may be registered as a trademark. This can be a powerful business asset if the startup’s offering is targeted at the mass market and will go a long way to differentiate its offering and build customer confidence and loyalty. Brands like Apple, Microsoft, and IBM immediately come to mind. What is the process of protecting an IP in Singapore? “Our integrated e-service portal, IP2SG, provides innovators and business owners with an efficient registration process. It allows online filing of patents, trademarks, and designs through a single platform. “Patent applications are more complex, and inventors should seek the professional services of registered patent agents who are experienced in the application process, strategic considerations, and drafting the patent’s claims. Claims define the scope of patent protection and it is important that the claims are drafted properly. “In Singapore, there is no need to file for registration to obtain copyright protection. Copyright protection is automatic as long as the work is expressed in a tangible form (such as in writing or in a recording). It is a good practice, though, to document proof of authorship in the event of an IP dispute. “Common methods include making a declaration before a Commissioner of Oaths, stating the facts of ownership and the date of creation or sending a copy of the work by post, leaving the envelope unopened so that the date stamp and unopened envelope serve as evidence of the work’s existence. What are the estimated costs for different types of IPs? “Briefly, costs for filing IP protection include the upfront application fee and the subsequent renewal fee. On April 1, 2017, IPOS lowered its application fees for trademark and patent protection to support our innovators and make IP protection more affordable. 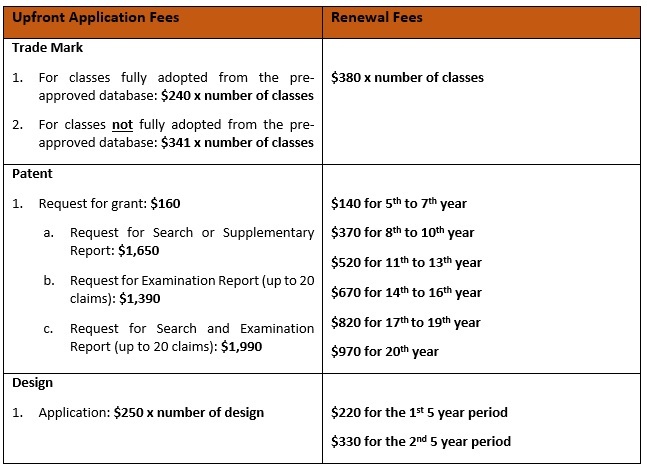 “As a guide, the application and renewal fees are briefly summarized in a table. What happens if someone replicates my IP? What rights do I have? “In the event that you find out that someone is infringing your IP by carrying out any of the exclusive rights you have as the IP owner, there are a number of actions you can take to enforce your rights. Does IP registration only protect my rights in Singapore? “IP registration is jurisdictional in nature. This means that your IP is protected only in the countries where you filed for IP protection. Defending your IP is very costly. Is it worth creating an IP if you can’t afford to sue others? “Yes, IP litigation cases can be very costly. However, the potential revenue losses, reputational damage, and loss of market share from such infringing activities can be significant too. Hence, startups are encouraged to obtain IP protection for their key IP assets, as it provides a measure of deterrence to potential infringers. “The Ministry of Law and IPOS are currently considering how the IP dispute resolution system in Singapore can be improved to help smaller businesses and startups find a less costly way to enforce their IP rights. “Meanwhile, bringing an action in court is not the only avenue to resolve IP disputes. Mediation is an alternative mechanism which is less costly and less time-consuming. This is the seventeenth article of the “Startup Advisory Clinic” series. Converted from Singapore dollars. Rate: US$1 = S$ 1.39.